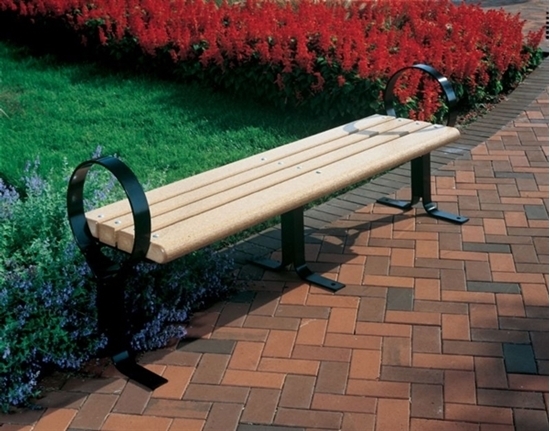 This 6 foot Recycled Plastic Flat Hoop Bench without back is made of commercial grade 3" x 4" recycled plastic lumber and a heavy duty 3/8" polyester powder coated steel frame. Surface mount design for stability and resistance to vandalism. Recycled plastic outdoor furniture is typically a one time purchase for businesses and parks as they last for many years. Stainless steel hardware is included. Rectangular 6 Foot Recycled Plastic Picnic Table with Powder Coated Steel In-Ground Mount Frame, 643 lbs.